This review recounts my daytime flight aboard Singapore’s fairly-dated regional 777-300 from Sydney to Singapore. As I metioned in my Rydges hotel review, we cut it far too close and arrived at the airport with mere moments to spare before check-in cutoff. Thankfully, we were traveling without bags. There was no time for the lounge today: we proceed through passport control and security and straight to the aircraft, which was in the final stages of boarding. Let me apologize upfront for the brevity of this review. As I explained in the introduction, this was written in 2013 and has never been published. I hope you will still find it useful, since the seats are still in service and the soft product hasn’t changed much. Even so, I acknowledge it lacks the detail that my latest trip reports offer. Onboard, we were welcomed by the Chief Stewardess (dressed in red) and directed to our seats in row 15. The seats were not what I was expecting: regional seats that were angled lie-flat. I would have known had I simply checked more closely in advance, but I expected a longhaul product for the 8hr flight from Singapore to Sydney. This was a United-booked award and it showed up in my reservation as a 777-300ER. It wasn’t. It was just a “777-300”. Not that it mattered too much on a daytime flight. The seat is actually more comfortable for lounging than the Singapore’s extra-wide lie-flat that must be manually “collapsed” into its lie-flat mode. Prior to departure, fresh squeezed orange juice was offered (along with sparkling wine and water). Service began with breakfast after takeoff. “Book the Cook” did not offer any breakfast options, so I ordered waffles off the menu. Breakfast began with fruit and yogurt, followed by very delicious waffles with whipped cream and sliced almonds. Breakfast was filling and delicious. We used “Book the Cook” to order pre-order pre- arrival lunch: salmon in wild lime butter sauce for me and grilled beef in green peppercorn sauce for my uncle. 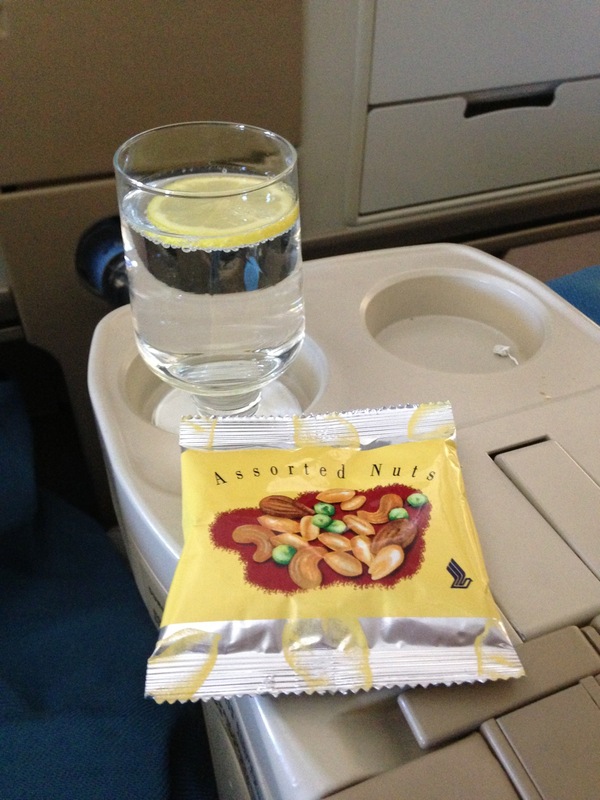 The meal began with “assorted nuts” (mostly wasabi peas) in a bag followed by a shrimp and scallop salad. Two shrimps and one scallop may not seem like much, but it was quite filling. The garlic bread and olive bread were tremendous. The main courses turned out nicely, though I think my uncle made the better entree choice. His steak was cooked a very acceptable medium. He also loved the au gratin potatoes. Business Class service was polished, professional, and friendly though certainly not on the level of the outbound trip in first class (and of course that was no surprise). Much of the flight was spent sleeping (ironic that I always sleep better on daytime flights with angled lie-flat seats) but FAs were vigilant to monitor for passenger needs. No amenity kit was offered, though toiletries were available in the lavatory. FAs did offer socks to each passenger in a drawstring bag. The on-demand IFE selection was phenomenal, though I dozed off instead of watching a movie. For more details on Singapore’s IFE, click here. We landed on time in Singapore. 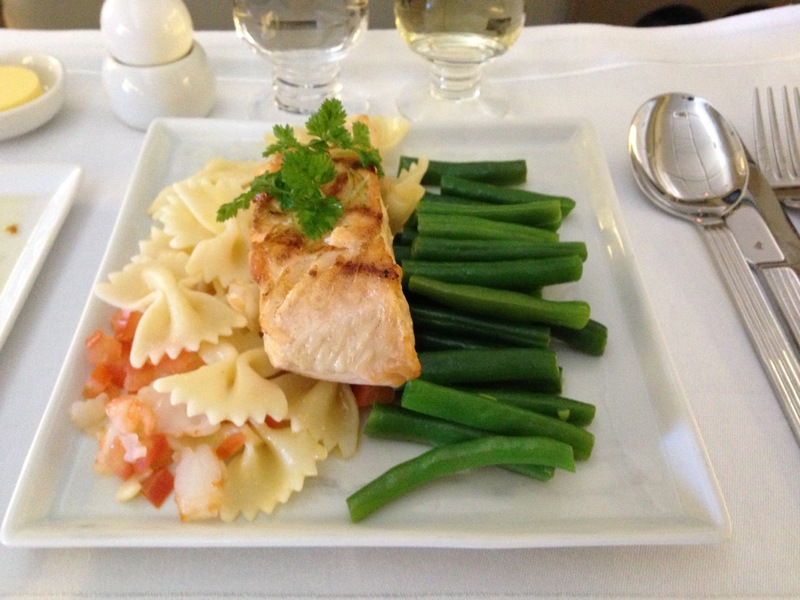 If I can summarize the flight, I’d do so in this way: two good meals and plenty of sleep. What more can you want from a daytime flight? It was a -300 for sure. I was surprised too, though. If you were a points redemption expert you would have known that United only has access to SQs regional J seats for redemption not the longhaul so it shouldn’t have been a surprise at all. Didn’t you do the seat assignments and notice the layout?! It’s funny that you posted this review when you did, as it’s the day SQ revealed the successor to this product. It always makes me chuckle how SQ uses these “regional” planes on flights that could be over 8 hours long, I live in London and 8 hours is very much a long-haul flight, and a regional plane is an Avro RJ85 or Embraer E190! I don’t think they are seen much on the SYD route anymore, but I believe the “secondary” Australian cities (Perth, Brisbane) seems them quite regularly. SQ always does a really good breakfast in J!